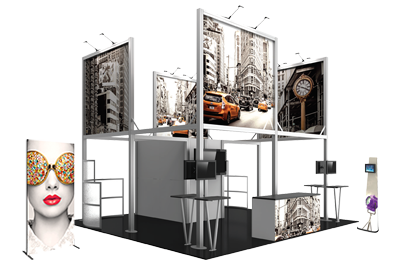 Orbital Express™ Truss Deluxe Tabletops are a simple addition to any Orbital Express Truss exhibit. Tabletops require no tools to attach, and are available in four thermoform color options. The teardrop shaped tabletop wraps around the edge of the truss length, and is available in left or right facing configurations. Deluxe Tabletops accent Orbital Truss exhibits, and provide additional space for discussion and product display.